The Forthright/GoSpeak team is one of the most prolific producers of spiritual and biblical content on the web. We’re grateful to work with a large and diverse group of faithful brothers and sisters in Christ. The question is how to keep up with all that good content. Social media limits access to much content, and moving timelines and statuses can cause one to miss it. On our website, we’ve solved that problem. Bookmark the ((feeds page)), which is updated automatically as new content by our team is published. But don’t wait long to check back. Every day the team publishes plenty of new articles, posts, prayers, and poetry. This entry was posted in updates and tagged biblical content, feeds, free articles, reading on 2016-11-29 by admin@JRM. Ramp up your willpower! CHOOSE! 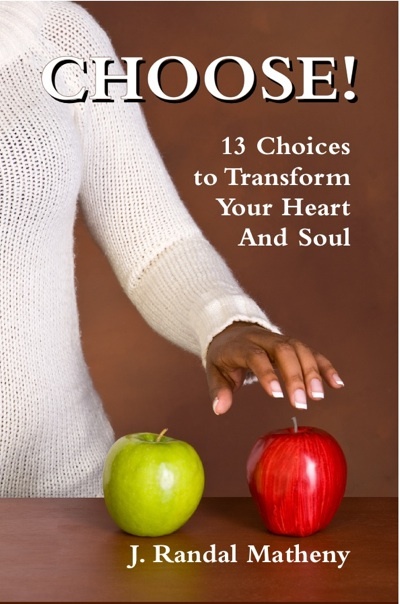 13 Choices to Transform Your Heart and Soul is now ready to be mailed to you today so you can make those changes you’ve been struggling to implement. The book opens the door to making right choices to change your life forever. With an almost poetical touch, the book brings a special feel with dark brown ink on cream paper. This entry was posted in Books and tagged Books, choices, Christian life, decision-making, decisions, motivation, reading on 2010-05-08 by J. Randal Matheny.